As we know beetroot has many benefits but sometimes ppl are put off by its color or taste. It is sweet with earthy flavour. Boil or roast and add little salt, fresh lemon juice. Good side dish or in salad. 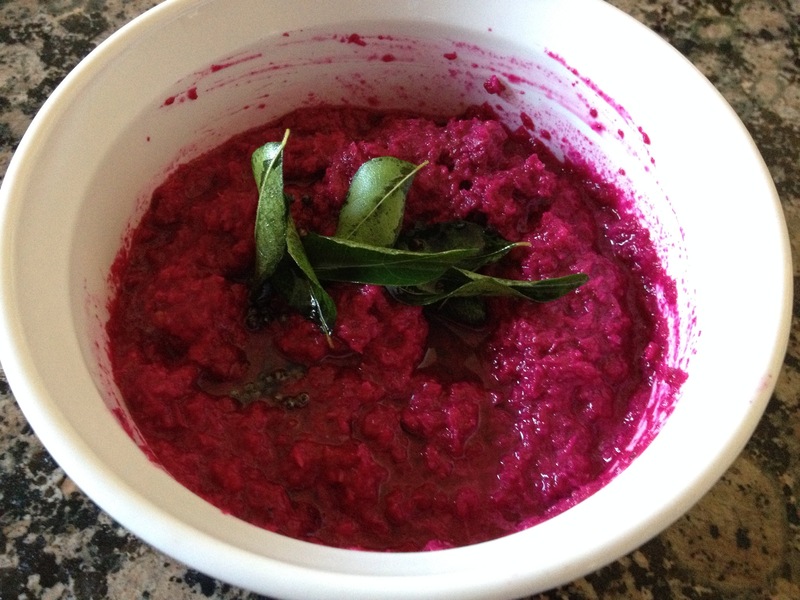 Make chutney like i did in picture with coconut, boiled beet root and green chilies. Add seasoning of mustard seeds, curry leaves. You can also add little lemon juice or tamarind for tangy flavour. You can have with dosa, idly or on the side with roti, curry. Chutney turned out good. Pink Rice: Add shredded raw beet to rice while cooking and you will have colorful, nutritious rice. Cumin seeds seasoning will make it extra yummy. I had beetroot curry at local indian place and it was good so i make it once in a while. Chop beet root in tiny pieces. They are really tiny. Heat oil, season with mustard seeds, urad dal, green chilies, curry leaves and add chopped beet root, salt. I don’t remember adding any other spices. Add water if needed and cook until done.. You can garnish with some shredded coconut. It makes a nice side dish. You can make carrot and beetroot juice. For 1 glass, it should be 3 part carrot and 1 part beet root since beet root is very strong. Beet root raita is also good. You can add boiled beet root pieces to yogurt or shredded raw beetroot to yogurt. Add roasted cumin powder, salt. Simple ! Beetroot is hard to peel and chop so i prefer to boil in pressure cooker first and then skin comes off easily and easy to chop too. Have fun with beetroot ! This entry was posted in Side dish, Tips. Bookmark the permalink.